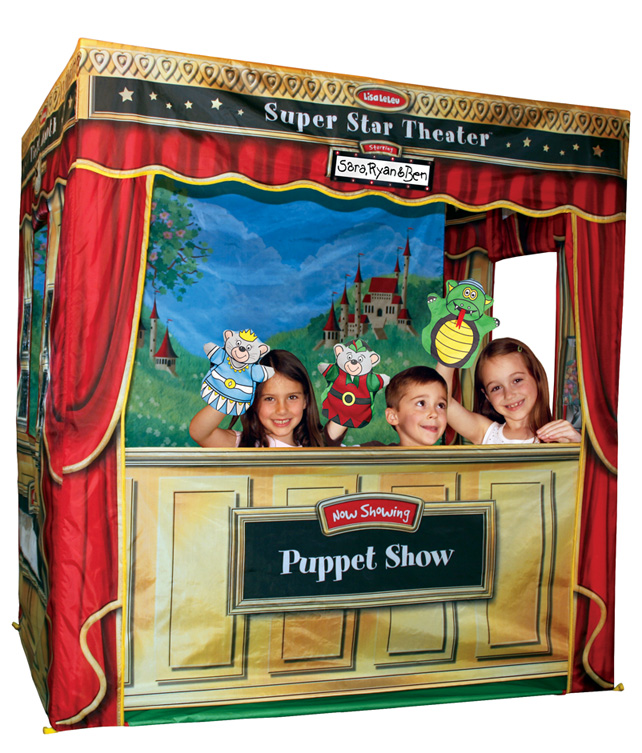 Give children the gift of imaginative play with this enchanting theater that doubles as a puppet show. The Lisa Leleu Super Star Theater comes equipped with everything your little super stars need to create a theatrical performance. Not only does it provide a stage, complete with stage curtains, dressing room, ticket booth and refreshment stand, it also includes a wipe-off marquee to highlight performers, photo frames, admission tickets and a host of accessories designed to create an authentic theater experience. 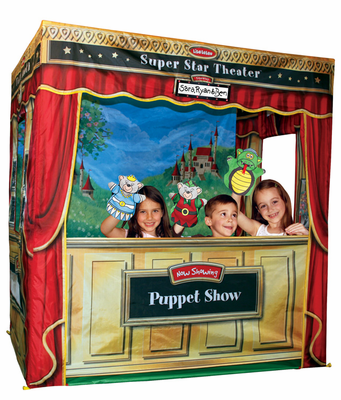 The super theater easily converts to a puppet theater with the included puppet panel, allowing children to create their own scripts and perform via puppet play. It even includes three puppets to get them started. This theater is a must for early elementary classrooms, day care centers and youth groups and can even be used in Sunday school programs to reinforce or expand storylines. While it’s valuable as a teaching aid for educators, and can be used with scripts for storytelling or for school performances, it can also be used in dramatic play centers to encourage student interaction through dramatic play. The easy-to-assemble theater features a fiberglass frame with durable polyester fabric with an enchanting backdrop designed to inspire imaginative play. It measures a full five feet in height with a width of 56 inches and a depth of 39 inches, allowing adequate room for perfromers. This theater rolls up to an amazing 23- by 13-inch roll 5 inches in diameter making storing the theater quick and easy. The super theater is recommended for children 3 years old and above. This theater provides children with the opportunity to explore dramatic play both through performance and puppet play and engages children in the learning process. It develops both expressive and receptive language skills necessary for effective communication, while taking advantage of the child’s sense of play. Children explore feelings and emotions and learn about the world around them from dramatic play. It also allows them to explore new roles and learn how to interact with others. It builds higher order thinking skills, interpersonal skills such as sharing and negotiating, and improves communication skills. Free Fedex Ground Home Shipping in 2-4 days. Self Confidence and Self Esteem: Performing for an audience teaches children to trust their ideas and abilities while overcoming shyness and fostering self worth. Through drama, self discovery and expression help instill confidence and boost self esteem. Reading Skills and Literacy Learning: As children practice their roles, they reflect on the words while evaluating and revising how they interact with them while interpreting and communicating their meaning. Reading and acting out scripts increases sight-word vocabulary, reading comprehension and literature appreciation. Children blossom when they become more confident readers. Communication/Oral Skills: Theater activities enhance oral expression including verbal and nonverbal expression of ideas, voice projection, articulation of words, fluency with language and persuasive speech. Presentation Skills: The exercise of acting out scripts enhances reading fluency such as volume, stress, rate, tempo and intonation while improving presentation skills. Concentration: Theater activities help increase attention span as well as observation skills. Listening Comprehension: By interacting with others, drama helps develop good listening habits. Cooperation/Collaboration: The cooperative effort needed to create a puppet show or theatrical play increases a child�s ability to work with others, sharing ideas and solving problems together. Problem Solving: Theater activities encourage imagination and improvisation. Improvisation fosters quick-thinking leading to greater adaptability in Life. Many teachers believe that improvisation is one of the very best ways for children to express themselves. Motivation: Theater activities bring play, humor, fun and laughter into learning - improving motivation. Self Expression and Relaxation: Drama and theater allow children to express emotions. Play acting activities release stress by releasing mental, physical and emotional tension. Self Discipline: The process of moving ideas to actions and performances teaches the value of practice and perseverance. Drama and creative movement improve self-control. Trust: The social interaction and risk taking in theater develop trust in self and others.